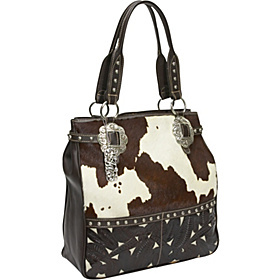 American West-Hand tooled filegree Cow leather and printed brown and white hair-on carryall of all carryalls! Accented with antiqued silver spots. Each and every American West item is still tooled by hand, one strike at a time, to create these beautiful works of art. Though these products are created by time-honored traditions, the modern day conveniences of cell phone pouches, credit card slots and zipper pulls (to mention only a few) are not forgotten in the design details. All of American West items are made of 100% hand-picked genuine leather with constant attention to quality and durability.